Thanks to my True Friend Talky Tina, I’ve been prompted to make a maze. I would really rather make a labyrinth, and may do so later. But for now, I made a GIFfy Maze. As you can see, Number 6 is at the center of this maze. If this was a real labyrinth, the Minotaur would be there. Can you find the secret entrance? (hint: it’s near the top) Can you trace the path through the Giffy Maze to have a secret meet-up with Number 6? I made this maze by using an online maze generator at www.mazegenerator.net. I selected options for a round maze of suitable size, and saved each of the six I made as a png. Note: you could save these as pdf files to print out and solve; plus, you can choose A4 or A3 sizes if you are European or letter or legal sizes if you are American. It was a simple matter to open these mazes as layers in GIMP. But I had to put Number 6 in the middle. I opened a previous picture of mine (the one where he looks like Chairman Mao (which I think means “Number One” in Mandarin)), but had to crop it to a circle and make extra stuff transparent so it didn’t show up. Then I had to duplicate that five times and merge all the pictures into the center of the six mazes. And export as a GIF. Really quite simple, but that’s because I already knew stuff about making GIFs with GIMPs. This also reminds me of how life is in The Prisoner. Number 2 always goes about trying to find the way to Number 6 and the INFORMATION he has hidden away in the maze of his amazing brain. And he is always right there in the center of things. 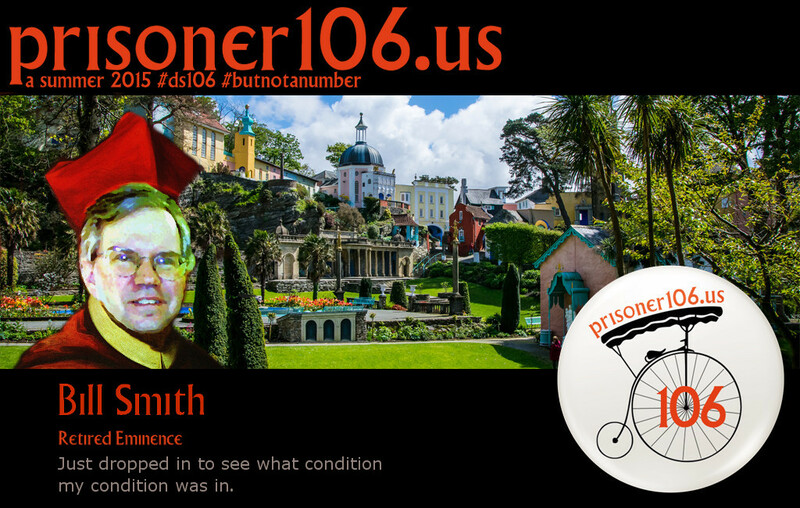 This entry was posted in Prisoner106 and tagged DesignAssignments, DesignAssignments1753, prisoner106. Love the maze, also the Mao reference as it kind of riffs the Mao in the sun, which always reminds me of Jim Groom & Tom Woodward for some weird reason. There is a prisoner 106 board game in here somewhere?